Often when I am starting a new wip, I feel that I have to go back and revisit all the things that I have learnt. Twyla Tharp called it polishing around the clock face. You work on one thing and then other things get a bit dusty, so you have to work on that. Without exercising various skills, it is impossible to stay in peak fitness. A big lesson for me when I was first writing was learning to trust my characters and their conflicts. Also not being too nice to my characters and resolving issues too quickly. Without conflict the tension goes down to zero. Another sign can be adding lots of subplots and extra characters. Or having them interact quite often with secondary characters rather than with their other protagonist. It is why authors spend a long time getting to know their characters and discovering what makes them tick. So you resolve one problem, andthat leads to another problem, esculating the tension between the characters. Making the stakes greater. Asking yourself -- how can I make this worse? How can I really turn the screws? Can I trust my characters to actually have deep seated problems before their character arc is complete? What are their feelings -- beginning, middle and end? Why will they be willing to give their love? What are the goals, motivations and conflicts? Back to polishing the clock, but some places always do require that bit extra. I have finished my Rita reading and have discovered several authors whose books I will actively look for. It is one of the great treats -- being forced to read new authors, maybe on themes that one would not normally read and discovering -- YES, what a fantastic read. The primary source documents for the Vikings are the Icelandic sagas. I know Tolkien drew heavily on them, but it always makes me blink when I discover little bits. Basically at the moment, I have been researching the old places of South Eastern Norway and Southern Sweden, in particular Bohuslu which was subdivided into two districts during the early Viking period. It is the area right next to Viken. Thankfully Ranirike fits my story as Alfhiem sounds a little too Tolkienesque for me. Tolkien of course drew heavily on the Icelandic sagas. And there is a certain amount of debate on how close to a true historical record they were. Yes, there is embellishment, but did the initial storytellers draw on kernels of fact? Did they root their stories in the fabric of time? Was there an actual Gandalf, not a wizard but a Viking king? How much did the Prose Edda shape Tolkien's imaginings? And ultimately because he created something new and different does it matter? Lloyd Alexander also drew on the same legends. Hence the reason for the similarities between the two worlds. The skill in the writer (or some would argue the ancient historian) is to take the bits and create her own world. But I do find it interesting...fossicking about and suddenly thinking -- oh, I can see echoes. Many thanks to Joelle, a reader of mine in France for noticing that A Noble Captive will be published by Harlequin France on 1 february under the title La Maitresse du Tribun. As far as I know, it is the first of my books to be published in French. Apparently, The Roman's Virgin Mistress will be published in French on 1 April. So that is another new language for my books, and it is time for me to brush up on my very rusty French. Anyway I went searching and discovered the blurb. 75 avant J.-C. Sur une île proche de la Crète, des légionnaires romains conduits par le tribun Marcus Livius Tullio sont faits prisonniers par le pirate Androceles et retenus au temple de Cybèle en attendant qu’une rançon soit versée. Là, dans ce sanctuaire niché parmi les vignes et les oliviers, une violente passion embrase Marcus Livius et la prophétesse du temple, Helena. Une passion défendue, car non seulement Helena se reproche de trahir son peuple en s’abandonnant au plaisir dans les bras d’un envahisseur romain, mais elle craint que Marcus Livius ne découvre son lourd secret. You may purchase it here. The Observer newspaper has done an article to help mark the centenary of Mills & Boon. Overall, it is a fair article. The journalist contacted me as part of her prep work, but I am not directly quoted in the article. My lovely friend Kate Walker is. There is a reason why amongst new authors that she is considered to be a queen. I suspect that one of the problems for the modern day journalist is that no author who is currently writing for M&B subscribes to Violet Winspear's view of heroes. This is the view that the shy spinster articulated back in 1970. I make no comment on her fantasies, but would note times have changed and many things are better understood. Yes, I make no apologies for my heroes being strong willed. My heroines are also. A strong woman requires a strong man. Simple as that. I think it is an act of self preservation, because instinctively well adjusted women and men do not want to be bullies or to be involved in abusive relationships. Where you have a mis-matched couple -- say a very strong man with a weak vacillating woman, or a milque toast man with a ball breaker, the relationship breaks down. And ultimately it is all about the relationship, and showing relationships that will have a lasting future. Anyway, read the article and enjoy. As it is the centenary year for Mills & Boon, some people are wondering -- okay where does this fit in with Harlequin, and how did the two companies get together? And why for example are there three editiorial offices? Harlequin was founded in 1949 in Winnipeg Canada to take advantage of the burgeoning paperback or pulp trade. Richard Bonnycastle was the mover and shaker behind the idea. And it was mainly to the presses rolling that he suggested it. His wife Mary was their first editor, proofreading the books at home. The Bonnycastles romance, in particular their wedding could have come straight from a Harlequin btw. Bonnycastle was at one time a fur trader and explorer and barely made his wedding. The first book published by Harlequin was The Manetee. In the early days, they published all types of pulp fiction, generally they acquired rights to books published elsewhere in the world, but they did publish a few original works. In the early 50s, they discovered the medical romances from British firm Mills & Boon were proving exceptionally popular and they acquired more. In 1964, Harlequin start to publish romance exclusively, again mostly acquiring the rights from British firm, Mills & Boon. Then in 1972, they purchased Mills & Boon from the Boon family and the companies were joined. In the late seventies, Simon & Schuster founded the Silhouette imprint to provide direct competition to Harlequin. Harlequin purchased Silhouette in 1984, after it received clearance from the US Justice Department. Silhouette's editorial office was based in New York and Harlequin continued to keep that editorial office there. Hopefully, this goes some way towards explaining the how and whys Harlequin came about. And the various editorial offices are where they are. If you want to learn more about the history of Harlequin, you can do so here. I pressed the button and sent my latest to my editor. I had an email back to say that it had been received. Hooray! Eventually my editor will get back to me with her thoughts on what does not work and where things could be strengthened. India Grey left a comment on my blog and the penny dropped what a great metaphor black ice is for when I get the thoughts back from my editor. Black ice is a good metaphor for the problems that she may discover. I am far too close. I can't see the ice. My editor can see it. Luckily, once it is pointed out, I am allowed to decide on what I am going to do -- around it, build a bridge over, try a different route, or spread some grit and get a lot more traction. But whatever I do, I have to make it my own. My dh obviously thinks that I plan to spend time cleaning the house...ummm there are reasons why I write. I have also have a pile of Rita books to judge and my TBR is still there. But I am glad to be onto the next stage with this book. Even after all these years of living in Northumberland, I remain a wimp. There is black ice out on the bank today as a result of wet snow that fell yesterday and froze. I decided not to drive. Having had my youngest's bus stuck in a snow bank on the way home (he takes the bus home from school but it leaves far too early in the morning), I suspect the bus driver will not be driving either. My youngest finally arrived home an hour late, having used the driver's mobile phone to let me know what was happening. I think he found it slightly exciting at first and then rather cold. I currently working on finishing the wip. This means putting the edits on the computer AND actually reading and rechecking for missing words, missing endings etc. I can no longer simply assume. I also keep asking questions. The best one thus far is what does the character feel about so and so -- beginning, middle and end. Also has each scene moved the story forward, does it need to be there. Is there any way that I can make this stronger. I am grateful for my extended deadline because I am taking the time to look at things. That way hopefully I will avoid the Black Ice in my ms -- you know those things that trip you up and you didn't see it coming. I type too fast and not very well. I could blame the keyboard which is full of crumbs and dirt. Or it could be wearing out. I have heard of such things happening. Sometimes my keys even stick, or the space bar doesn't work when I think it has. But really it is all down to my terrible typing. When I reread what I have typed, I see the words I think I have typed. Sometimes they are not there. Sometimes they are misspelled. But do I see them? NO! I go blithely through life thinking everything is fine, UNTIL that great moment and I reread and squirm. How could I have been that blind? How could I have done that? I know how to spell the or what. I can see them (sometimes) if I go to another medium -- ie hard copy. I can see them (often) when I read the work out loud. This is I do not do enough. I need to. My new editor (aka my first editor) will not put up with it. She will point it out during revisions. I need to make sure that piles of wool do not turn into peas. I need to make sure the motivation is on the page instead of in my head. I dislike giving her more work. Honestly I do. BUT mainly I need to make sure that I turn in clean copy with a Good Story. I am a terrible typist but there are ways in which I can improve. I will try. Truly. The wip is in its final stages and these things become important. The Romantic Novelist Association announced the shortlist (the finalists) for the Romance Prize. It is a very strong list and includes some of my personal favourite category writers -- Kate Hardy is there for her Breakfast at Giovanni's (I forget the US title for this wonderfully feel good book), Julie Cohen for Driving Him Wild which she used Eric Banna as inspiration and has a pigeon. It is out in the US in February as His for the Taking. Liz Fielding for The Secret Life of Lady Gabriella, the title might not be as hooky as some but oh what a story. Lucy Gordon for The Mediterranean Rebel's Bride. I haven't read this one but I love the way Lucy writes -- feel good satisfaction always. And finally Fiona Harper has TWO books in the finals, both melt in your mouth feel good romance --Her Parenthood Assignment and English Lord, Ordinary Lady. No Historicals on the list this year, but plenty of feel good romance. The winner will be announced on 4 February and I really do not envy the judges. I think the real honour is in the nomination. Oh Kate Hardy is giving away a copy of Giovanni. See her blog for details. It is a marvellous book. I learnt yesterday that my new editor is leaving HM&B to pursue a different career. I wish her well and am very glad that I dedicated A Question of Impropriety to her. I do think she pushed me in certain directions and challenged me to improve. My new editor was also my first editor, so it is very much like coming home. She is also the senior editor of the historicals and someone I respect very much. Her thoughts are like gold dust. I am also pleased to be within the historical team as it were. It is one of those things you rapidly learn in publishing -- editors come and go. They are doing a job and have lives outside. it is a working relationship. Occasionally, one has a friendship. I think your first editor always hold a special place. But it is a working relationship. Being able to work with a wide variety of people and seeing how the why behind their thoughts is very important. Each editor has a different style. they may all be saying the same thing. A Christmas Wedding Wager has been added to the list of nominees in the second interim of All About Romance Reader's Poll. It is in the Best Europeon Historical Category. The real pleasure is in the nomination. But it is one of those things, readers need to go and vote/nominate their favourites. The more people who do, the better sample they get. From what I understand series romance often does not get that many votes. And there are some cracking books listed there. Also my very good friend and critique partner Donna Alward has been nominated in the debut category. Michelle Wililngham's Her Irish Warrior has been nominated in the Best Medieval category. So it is congratulations all around to the nominees. Right, hopefully from the previous two parts, you will have been able to determine the type of block or impediment that you have because there are very different solutions. For example, if you are suffering from true writer's block, there is no point in trying to sit down and write. You need to get away. To do something else. Possibly structurally creative like sewing or cooking. Reading outside the genre you are writing may or may not help. You also need to give yourself time. Time to refill the well. Make a contract with yourself that you will take time and make it specific. Then go back and try. If you are experiencing the same thing, repeat. You will know the difference. If it is FEAR, taking time out will only exacerbate the problem. So what can you do? 1. Write and write every day. The most successful writers write something every day because the story is fresh in their minds. Set a minimum goal. A paragraph can be enough. A sentence. Four words even. Work regular hours. Set up a schedule. I get up early and work then because my subconscious has been working while I sleep. Some people work better at night. Know your work pattern. Take regular breaks. Reward yourself with breaks. 2. Get away from your computer and all electrical equipment and write long hand. Rediscover the joys of putting ink on paper. Scribble a note on scrap of paper. Then go back to the computer and type up what you have written. In this way you have a definite task. I do this one a lot. 3. Simplify your rituals. Everyone has rituals (see Twyla Tharp's The Creative Habit) but sometimes those rituals become all consuming and do not leave any time to write. Books have been written in noisy offices, with screaming babies, on trains, planes and the kitchen table. You do not need two hours to get a sentence down. You do not need a clean computer screen or all your emails answered. Or your blog updated. Quick and easy is best. 4. Write a simple generic sentence, knowing that it is easier to fix a bad page than a blank one. You do have to remember to go back and revise them. But one sentence means that you have started. And one word follows another. Force yourself to open the file. Learn to work with the entire document rather than dividing it up into individual chapters. For example, use bookmarking. Ctrl end will take you to the end of the work. Insert break will give you a chapter break. that way you are not constantly starting with a new document. But remember to backup. 5. Force yourself to finish. Commit to the end. Write the ending or decide what you are going to give yourself as a treat. Work on one book at a time. Or have definite times to work on each project. For example James Patterson apparently moves around the dining table, with sets of papers. When he is sitting in a specific chair , he is working on a specific book. 6. Have a definite place to work. Make sure all your tools are there and you do not have to search them out. But remember writers have been known to read dictionaries and thesauruses for entertainment or distraction. It is amazing how attractive a dictionary can become at times. If you use the internet as a distraction. Make sure your workplace computer is not connected. Keep your work place simple. 7. Get exercise. Exercise frees the mind. Dickens and Kipling both used to walk miles every day. Walking improves the spirit. Getting outside can make you notice things. Movement. You see things and perhaps even come up with ideas. 8. If you really think your work is POS and hopeless, try this exercise. Bernard Cornwell did it. And it may help with your confidence. Find an author you admire. Take a scene in the middle of the book. An average scene. Type it up in the font you use. Print it out. Read it again. It probably looks different and not necessarily as good as you thought. The printed page looks different to the typed page. And ALL writers write average scenes at some point. Not even Dickens or Shakespeare wrote pure genius. Then go back and look at something you wrote. It worked for him. 9. Read about how other authors work. See what their habits are. What fears they fall prey to. Know you are not alone. I think it is Paris Match that has hundreds of interviews with writers about how they work. 10. Avoid crutches such as alcohol or drugs. Ultimately they sap creativity. Know that the creativity comes from within you, not from anything else. It is the desire to write that shows you have talent. Everything else is learning to control and maximise that talent. But learn to relax. These are just a few suggestions and hopefully they help. I found yesterday that my ninth book --A Question of Impropriety has been accepted. It is my first proper Regency. Okay so it is set in the North East of England and has more to do with steam engines than the Ton. But it is still a Regency and I get to keep my title. I was so surprised and pleased about keeping my title. It is the story of Diana Clare who fled back to Northumberland after her fiance was killed in an infamous duel and Brett Farnham, the Earl of Coltonby, who is a notorious prince of rakes and who has won the neighbouring estate in a horse race. It will be out in November 08 in the UK, US date tbd. I am going to take a slight break from Writer's Block to mention that bane of historical fiction -- info dumping aka vomiting on the page, regurgitating all the research you did and letting the reader know about whatever. Actually it is the bane of fiction, but historical novelists can really fall prey to it as some of the source material is out of copyright. Sometimes, it seems like the author is waving a big placard -- Look at me and aren't I clever? Or I did all this research on x and you are going to hear about it now! But to my mind, it is just boring. At the moment, a historical romance novelist stands accused over stepping the mark on info dumping and actually plagiarising research. I make no comment on the ins and the outs of the case. The basic advice is do NOT Info Dump. It is an easy way for novelists to get into trouble, and not simply with accusations of stealing but more importantly with accusations of boring the reader senseless. Every piece of information that is there must be there because it furthers the story, not because the novelist is very interested in the way lace is made or how a jet engine works. The reader is interested in the story. The story is king in commercial fiction writing, not the research. Fiction readers are tension junkies. There is a convention called fair use. This means no one owns facts or ideas. It is the way that the writer puts together facts and ideas that makes the work the writer's own. And one could get into a big argument whether or not something is a fact or someone else's wording about a fact. And if you are getting into that arguement, it means that the writer has not done her job properly because the fact/info dumping has pulled the reader out of the story. The amount of research I do is huge. I enjoy it. It gives me confidence to write about the time period. But do I want to pull the reader out the story? No. The reader is reading for the romance, not for information on how the steam engine was developed. And right now, I could bore you stupid on steam engines of 1814. The Newcomen atmospheric v the Trevithick high pressure system. Blenkinsopp's rackett system. It is so bad that I am muttering under my breath at The Industrial Revolutionaries as Weightman was imprecise on certain things. I have done my research at the Lit and Phil with the primary source documents. Mutter, mutter, mutter. But none of it will get into my current wip. It just means I know what my hero knows. Unless a reader is an avid fan of high pressure systems then they are going to skip over it, and get to the good bit. Possibly put the book down and never come back. Possibly throw the book against the wall. Possibly never buy another one of my books again. Writing is all about furthering the story. It is about using bits of research to increase the emotional tension, rather than to kill it. If you feel the need to info dump, you should be writing non fiction about the subject, not a commercial novel. It is not what a novel is about. Every piece of information needs to be furthering the story. It needs to earn its place in the story. It should also be seen through your characters' filter. Which mean it should be coloured with the novelist's words rather than a strict and stark recitation of facts. Why is this information important to the character? Why does the information need to be conveyed to the reader, and how. How do you put that information in the language of the story? How do you give that little glimpse into the world? How do you make the world leap off the page in vivid technicolour? How can you world build and make that world your own? In writing, world building is so important. If a writer has not built her world properly and is not comfortable with it, she will be more tempted to info dump. There are no short cuts in writing. The biggest thing I ever learnt and this was from Donald Maass -- was tension, tension, tension. The reader demand tension. Make your book as full of tension as possible and you will not be tempted to info dump. When you are revising, any time you see a place where there is a lot of information, it should be a Red Flag. You should be looking to see how you can up the tension. How can you get the reader to turn the page? Every scene should be accomplishing several things. Make those scenes work for you. Add little bits of research in your own words. Do not be didactic and teach the reader. Assume the reader possesses a modicum of intelligence. Allow the reader into your world. So the moral of this blog is: DO NOT INFO DUMP. Weave the information into your story and make it part of the warp and wheft of your story. Make it belong to you. Okay, you might not have true writer's block but you can easily have a writing impediment. And I am well aware, that true writer's block can be caused by things other than grief. It is just what caused mine. Writing Impediments are caused by FEAR. And writers are subject to many fears. These are sometimes known as the Crows of Doubt, but they are different from true writer's block. I am saying this because certain authors deny that writer's blocks exist. And if a writer has a bigger fear -- say the house being repossessed, or a great need of money, chances are they will not let the impediments stand in their way. Basically, Bigger fears tend to drive other fears away. Writer's impediments can be a luxury. Fear of not having enough time to write. Fear that it comes easy for everyone else. Fear that the daemon has left you. Fear that you are going to be found for a fraud. Fear that your novel is fluke. This is not a complete list and other may have their own particular Crow to add. Basically it boils down to a Fear of Rejection or some how of being mocked. And this fear can paralyse you. It is not a true writer's block, it is Fear. And Fear can be conquered. It is one of the reason why people study the writer's craft. It is why people speak of having a toolbox. There are ways to stay productive. And not every coping strategy works every time. So when you think you are suffering from writer's block, you have to decide if it is true writer's block or merely an impediment. The cure for true writer's block is to take a break. The cure for impediments is slightly more complicated but involves not taking a break. Tomorrow I will look at some of the other coping strategies. And this is a very genral over view, but know that every writer does suffer impediments to thier writing. And as each writer is an indivdual, the impediments can be different. DG in the comments sections of my latest section commented that he had been thinking about writer's block and my word about lumpy day old porridge struck a chord. Now I am not sure I have ever written about writer's block, but I do know about it. Writing lumpy day old porridge that slowly congeals on the plate is NOT writer's block. You can work with lumpy day old porridge. You can play with it. You can make it better. Or you can see ideas that did not work and can make it better. In other words, it is a bad page, not a blank page. Bad pages can be fixed. Blank pages are just blank. True writer's block is something different. It is when you become a dry husk, totally squeezed out of ideas. And you become afraid to put the next word down. Or you become physically incapable of putting the next word down. This is often in response to some severe stress. Your mind is so busy coping with something or several somethings that the creativity and energy needed to sustain it disappears and all ideas flee. For example when my father died and then I had my first child, all my desire to write ended. Vanished. The world became a shadowy grey place for awhile and I had to go through the grieving process as well as adjusting to being a new mother. Then a few weeks later, my brother became seriously ill and eventually died. And I can remember thinking what is the point of wanting to write romance. I should want to write something deep and meaningful, but nothing deep and meaningful would come. During this period, I also gave up reading romance and mostly confined my reading to factual texts like how to look after children or gardening. I thought whatever spark I had had gone forever and became afraid to try, so I put fiction writing to one side for about 12 years. Oh my daemon after awhile would try to tempt me and I would get flashes of stories, tantalizing glimpses of the sunny uplands but I resisted, remembering what it felt like to be a dry husk. During that period, I would write the odd article for newsletters or keep an occasional journal but I did not feel capable of writing for publication. It was not until I was hospitalised in 2002 that I thought right -- I am going to try to pursue my dream and became serious about writing again. It also helped that a lady in the bed near me said -- you know in times of trouble, you can't go wrong with Mills and Boon and Penny Jordan. And I thought - oh I was wrong. Escapist literature is fine. In fact, it can be very necessary. Then in 2003 after I joined the RNA, I read an article in their magazine. I think it was a report on a workshop. Anyway, in that article they did say that grief and other severe stress could trigger writer's block and a load rolled off my back. There was a distinct trigger. While I dealt with my grief and everything else in my life, I had true writer's block. But true writer's block does not last long. It is the fear that it leaves behind that lasts. There is a saying that writers who need money never suffer prolonged blocks. This is because the need to survive is often greater than the fear of failure. Writer's block is in many ways a luxury because you are giving into fear. People who can not afford to don't tend to have it. And tomorrow, I am going to write about some of the fears that can impede writing. being impeded in writing is different from being blocked -- but it is not less real. Then I am planning on offering some strategies for overcoming the fears and hopefully becoming more productive. In the meantime, I need to finish my wip. I have long had a problem with the concept of a muse. Muses are traditionally very pretty young women who inspire. Striking interesting poses in very pretty Grecian robes. Flopping down and sighing a lot. And I have always thought more suited to men. However, as I have been reading Kipling Sahib, I see that Kipling spoke of his inspiration not as a muse but a private Daemon who came and sat on his shoulder as he wrote. I thought it interesting as of course Phillip Pullman wrote His Dark Materials long after Kipling. But I can also understand what he meant. there are times when the words flow -- no reason -- but they flow from my fingers. And I can read them back and think -- yes, this is what I meant to say. Other times, my writing is like day old porridge with lumps in it. It just happens. And I know that if I keep showing up and writing, the inspiration will strike again. It does come from somewhere deep within me, but I do not want to examine it too closely. Daemon is a variation on demon, but in some ways is more sorted to me as a writer than the languid muse. Demons are mischievous. Daemons tantalize. Daemons can take different shapes depending on their mood. They are not just languid young women -- although could be on occasion. Daemons can come in on cat's paws, or lumbering like a bear. They can be young or old. It depends on the daemon's mood. A muse's form to my mind remains steady and unchanging. Daemons are not sitting around, waiting, or spouting poetry about God's daisy chains. Daemons are active. Daemons are liable to pounce at odd unexpected moments, whisper a few words and then depart laughing. Daemons like to be put to use. Daemons do not worry about dust balls. Somehow, I always get the impression that a muse wants the room to be tidy so her frock won't get dirty. Daemons don't care. In short, I think my muse is daemon. Now all I have to do is consider its form. So do you have a muse or a daemon? And if a daemon, does it have a form it prefers or does it keep changing shape? My dh put his foot down yesterday and ordered me to bed. I think he is worried about my cold turning into something worse. The children uniformly agreed with him. I made notes on my wip. This is slightly annoying as I did want my first draft done TODAY. But I have also realised several things that need to be incorporated into it. So perhaps the enforced rest is doing me good. 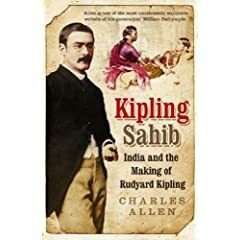 In the meantime, I have been reading Kipling Sahib about Kipling and the making of Modern India by Charles Allen. It is interesting from a novelist's point of view to see how he grew as a writer and where he took his inspiration from. It is also far too facile to simply dismiss Kipling as an Imperialist. My favourite Kipling stories are the first Jungle Book and Just So Stories. I was interested to learn more about Kipling after seeing the drama My Boy Jack. Some of Kipling's early troubles and his own myopia probably contributed to his pulling of strings with his son. Kipling's early life does remain shrouded somewhat in mystery as he did attempt to burn all private correspondence, diaries etc. He wanted to be judged on his work. He called his muse -- his private deamon. And Kipling did have such a wonderful way of conjuring up pictures with words. I happened to be looking through the RWA Market Update, mainly to see if the news of my old editor's move from acquisitions had been announced yet. It hasn't. But as I was scrolling down, I happen to see Black Lyon Publishing and their new line caught my eye -- Ancient Time Romance. It is dedicated to historical romance set before 1000 AD. Black Lyon is an e-publisher and as such does not pay an advance. It also means that it is small press, possibly micro. But it is non-vanity/non-subsidy. What was interesting to me was that they were starting this line. From the RWR, I saw that Dorchester was also publishing something -- Romano British, I believe. So it is sort of kewl to be at the forefront of a trend. To be able to think -- ah, but I told you so. People do want to read it. The RWR this month published an article by a Kensington and Dorchester author, Deborah McGillivray about the fact historicals are back. Or indeed did they ever go away? Basically the market share became smaller, publishing slots fewer, but they still represent a large percentage of readers. The author apparently did some research with Amazon community and discovered that most of her respondents were first time/only been reading historical for a year or two. She had expected that it would be readers returning to the fold as it were but the genre is attracting new readers. There are several problems with a self selecting sample and the size was probably too small to be of lasting value, but it was interesting. From the letters I get, I too see a lot of new to historical readers. One of the reasons McGillvray gave was the increased popularity of certain television shows such as Rome, the Tudors, Deadwood etc had stimulated interested. Of course, the BBC showed a very high bonnet count this Christmas as well. Well done historical series in the media are popular. So what are the trends in Historical romance. One big one I would say is the early middle ages. I know from my conversations with editors that the early middle age/warrior books are proving popular. It is partly why they decided to put Taken by the Viking into the US before I finished the series. I think the early Victorian period/Industrial revolution will be a growing area. A number of authors have had success with that, including me with A Christmas Wedding Wager. The success of Cranford, North and South, and Jane Eyre on television shows that there is an appetite for this period. I understand that there is a movie about the young Victoria that is coming out soon. And I do think for a certain section of readers, they do not make too big a distinction between early Victorian and Regency. I am not seeing paranormal in historicals as a trend at HH btw. Other publishers may be, but not HH. The HH reader still seems to prefer the straight historical. I also think there remains a trend for Unusual historicals. However, the stories have to be strong. But ultimately the big trend in historicals is the same as it always was -- excellent stories that hold readers gripped to their seats. As with anything in romance publishing, things go in cycles. I fully expect to hear that Vampires have reached their peak, or that law enforcement heroes have maxxed out. This is mainly because they have been so strong over the past few years and publishing slots have increased. It does not mean that no books are being sold with these themes, simply that the growth rate has slowed and the books need to be super strong. Ultimately, it is the strength of the story that counts. My lovely, lovely editor said that she preferred a strong manuscript from me and was quite happy to move my deadline to achieve it. So I do not have to pull several all nighters. But there again, deadlines always loom.It is part of the nature of the business, particularly when you are under contract. Then you hear tales of all nighters, and being glued to the chair but in the end, they pulled off this fantastic best seller. Normally at this point, I want to slink under the chair as I know pulling an all nighter is beyond me and it certainly will not produce much beyond gibberish. I salute each and every author who can pull this off, but it is not me. Just as getting no revisions is not me. It does not mean I am a worse writer. It simply means that I am different. And there is NO correct way to write a book. Don't get me wrong. I hate, loathe and destest missing deadlines. I like being reliable. I think it stems from the fact that my father was always late. I will move heaven and earth to make them, but I want to produce a quality product. So at the moment, I know this ms will be finished by the contracted deadline, but I want some time to edit and to bring it up to my standard. And for every author, each deadline brings its own problems because each story is unique. Some write themselves and others seem to take time. This one is taking me longer for a variety of reasons. I am enjoying it and I do think in the end, it will be a fantastic read. Ultimately editors want quality manuscripts. Editors tell tales of writers who were seventeen years late. Authors being late with delivery happens. Editors want to work with authors. They do not want them to suffer burnout. I am currently waiting to hear back from my editor who has repeatedly said -- quality, Michelle. And deadlines are moveable feasts. Also there is a question of how late is late. And writing remains one of the best jobs in the world.